We have a "hurricane" cover on our above ground pool. This cover sits over a large air pillow and we put sand tubes all around the edge of it to keep it on. Every year, however, we end up with a place that manages to catch some snow or water and then it freezes into a big lump of ice that we have to deal with. We bout these small and 4 large ground screws to anchor the cover so it will be more taught. This will help us prevent any low spots for water to gather. Although winter weather hasn't hit us yet, we've had quite a bit of rain and so far these screws are doing exactly what we wanted and are keeping the cover in position. They were easy to use and they feel very solid. Works well - as described. These are the best. Sturdy and seems indestructible. Used them for our recent camping trip and the are easy to use and does the job. With recent high winds in the area we didn't thing there was anything that was going to hold the tarp. We were fixing our previous stakes daily. We have had these stakes for two weeks now and not one stake has come out of the ground. Great investment. In Hawaii we have things rust out, but not this time! I can screw into briney sand so my dog is secure while I swim! 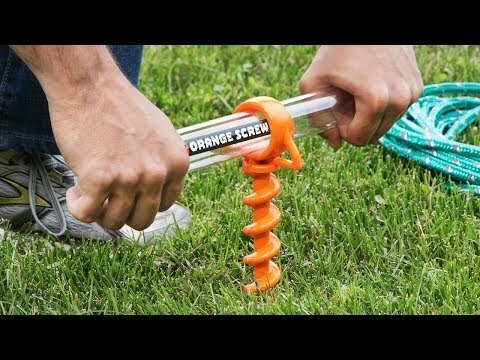 We purchased one set of these and tested them out at the beach. Worked great. We ordered a second set for our son and daughter-in-law to use for their camping tent. Work Great as Tie Outs! I bought these for use with cables to tie out my dogs, (80 lb and 17 lb). Even though the sand was a little sandy, they held great. This size worked well at the beach to hold the Sunbrella. I returned the larger size screws because they were bigger than we would need. 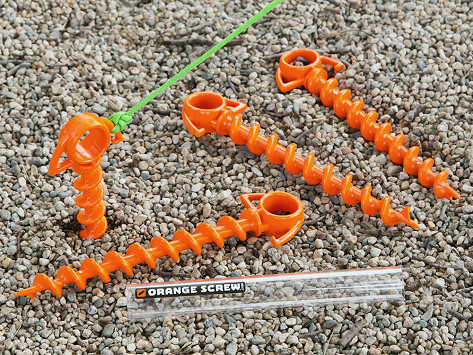 Orange Screw is a spiral ground anchor that is a lot tougher than you might think. It handles tents, tarps, and other lines easily and securely, and is Made in the USA from recycled materials. The sharp screw stakes into all types of soil to anchor just about any line. For added leverage, slide the clear drive tool into the screw to help drill it into the ground. The drive handle can stay in or pop out. The smaller screw holds up to 400 pounds, and the larger up to 650. It’s a solution you’ll find yourself using surprisingly often—like on camping trips, at the beach, or at home.